Finland's Social Democratic Party declared a narrow victory in Sunday's general election after the party scraped a lead of just 0.2% over the far-right Finns Party with 99% of votes counted. 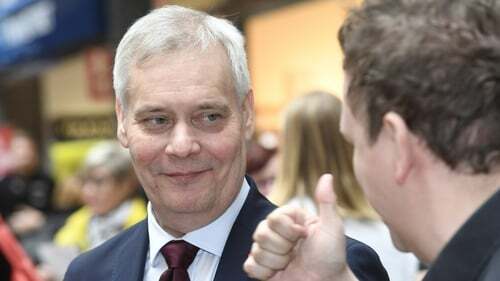 "For the first time since 1999, the Social Democratic Party is the party of the prime minister," leader Antti Rinne told supporters, after his party picked up 40 seats in parliament, one more than the Finns Party. Underscoring the growing confidence among far-right politicians in Europe, anti-immigration parties have announced plans to join forces following the 26 May EU election, in a move that could give them major say in how the continent is run. The success of Finland's Social Democrats marks a departure not only for Finland but also elsewhere in the region, where leftist parties have struggled in recent years, yielding some of their hold on the working class vote as anti-immigration nationalists of various stripes emerge. In neighbouring Sweden, Prime Minister Stefan Lofven has precariously clung to power after his Social Democrats suffered their worst parliamentary election result in more than a century last autumn. To do so, he had to enlist the support of two liberal parties with a pledge to enact a string of far-reaching right-wing policies. Mr Rinne calls his party's immigration stance "the middle way", favouring work-related immigration to compensate for Finland's ageing population, but he also favours allowing some refugees in on humanitarian grounds, as the country has done thus far. His talk of raising taxes is unlikely to drive off his supporters, many of whom value highly Finland's huge welfare state. Altogether 19 parties ran in the election, with eight of them already holding seats in the parliament.